Our classes generally run in the fall & spring alongside our Nursery/Gym School schedule and a special summer schedule is offered alongside our Summer Day Camp program. Please check our locations for offerings & availability. This program is designed to music where the adults help to stimulate baby by moving arms and legs. The beginnings of rolling, concepts of backwards, under, through etc. are taught. Free play with age appropriate toys and equipment, bubbles and more are included in this class. This is an opportunity to meet other moms and children! Caregivers and grandparents are always welcome. This program is specifically designed for you (or that special someone) and your child and provides for parent/guardian and child interaction during basic movement and tumbling. Teachers take special care to show adults proper spotting techniques so safe tumbling can be practiced at home. Music is an integral part of our program and familiar tunes and songs are used to make this class a rewarding experience for you and your child. Our unique “slow separation" class that is "pediatrician recommended". When the time comes to begin that separation with your child, M.A.T.S.S. can help make the process less traumatic for you both. Adults will be "weaned" out of the class slowly; the amount of time necessary to have complete separation will vary and is dependent on the dynamics of the class. The basic structure and music of the "Anyone and Me" class is repeated so that the child is comfortable and familiar with the routine. For the child ready to accept instruction on his/her own: a program set in a relaxed atmosphere that builds confidence and self esteem. Concepts such as sharing and listening are taught through music, movement, tumbling and games. Class activities such as art, story and snack time are included. 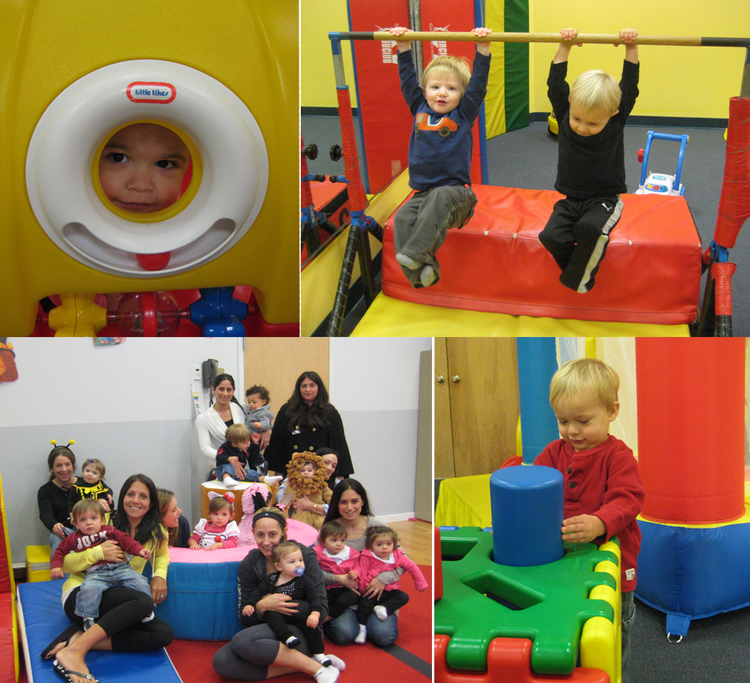 .....and all our Infant/Toddlers classes offer a natural bridge to our Nursery School "GymSchool" Program!